2. Article: Does a GMAT score of 750 increase your chances of admission more than a score of 700? To start with, here are the latest score distributions for the GMAT. 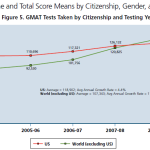 As of 2014, the mean GMAT score is 547. The 90th percentile score is still 700. The mean GMAT quant score is 38. The 90th percentile quant score is 50 (that’s very difficult to get). The top quant score is 51 (despite the table above that says 51-60). I think you can get a Q51 even if you miss a couple questions. The mean GMAT verbal score is 27. The 90th percentile score is 39. Again, the top score is 51. It’s interesting to note the changes since a few years ago: the overall mean score has increased, the mean quant score has slightly increased, and the mean verbal score has slightly decreased. This is probably due to the greater proportion of international students taking the exam. 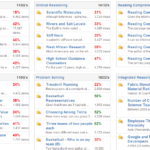 The mean analytical writing score is 4.3, and the mean integrated reasoning score is 4.3. I wouldn’t read too much into these statistics, but just aim for a score that’s at least above the average. In other words, aim for a 4 on the writing and a 5 on the integrated reasoning. These two sections are not weighted very heavily by admissions committees. The GMAC is still trying to validate the use of the integrated reasoning section. Now on to the main article. The popular perception among MBA applicants is that a GMAT score of 700 is the magic number for acceptance into a top-ranked business school. Many applicants aren’t comfortable until they have the magical number of “7” in the hundreds digit of their score. However, you may be wondering if an even higher score – a 99th percentile score – will differentiate you from the other applicants to top MBA programs. Increasing your score from a 700 (94th percentile) to a 750 (99th percentile) may require additional study time of anywhere from 20-50 hours, and you may wonder if it’s worth it. To answer this question, I began with the data published by the top-ranked schools. It’s a bit hard to compare, but it’s a start. At Harvard, the middle 50% score range of the most recent incoming class was 700-760. At Stanford, the median GMAT score is 730. 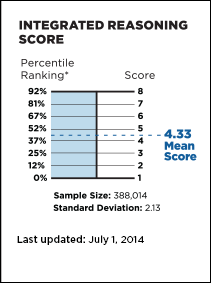 Finally, at Wharton, the average score (which may differ from the median) was 715. From these numbers, it appears that admissions officers at these schools put a slight premium on 99th percentile scores. Next, let’s go a little further to see just how big the advantage is for GMAT scores of 750 or higher. For this analysis, I used data published by the Kellogg School of Management at Northwestern University. In 2009, Kellogg had a total of 5,795 applicants, and 689 students enrolled. That’s an 11.8% enrollment rate. Now here’s a key point: the enrollment rate differs from the acceptance rate. Not every student will accept an offer, so adcoms have to admit more students than will actually enroll. These two figures are related by what is called the yield – the percentage of students that accept their offer. The most recent data I could find for Kellogg indicates their yield is 57%. This means that 1,208 students were actually given offers in 2009, an acceptance rate of 20.8%. The data in this second table indicates that you have a 29% chance of admission with a 750+ score, as compared to a 21% chance of admission with a 700-740 score. Now here’s the kicker: this table assumes a flat 57% yield across all GMAT score levels. However, this may not be an accurate assumption. The adcom at Kellogg knows that if they extend an offer to a <640 scorer, that applicant is much more likely to accept than a 750+ scorer. This means that the advantage of scoring 750+ is probably even higher than indicated in the second table. Beyond the [GMAT] lies such qualitative measures as leadership and teamwork skills, managerial experience, initiative, ability to learn and growth from mistakes, introspection, ability to articulate clear reasons for an MBA and career goals going forward, contributions (to school, work, and/or community), etc. It is here that the bulk of time of applicant evaluation is spent. 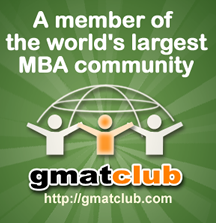 Although less quantifiable dimensions than the GMAT, they are equally important. I would think that the law of diminishing returns kicks in after a while. If you’re not good enough for them at 730 then what makes you better at 750? GMAC says that scores can vary by as much as +/- 30 on any given day. Basically, if you’re a 720 scorer you could go as high as 750 and as low as 690 just based on the variability involved. Even HBS Admissions Director Dee Leopold says that once you get over 700 you have “checked the box” for GMAT. For those wondering how to get accepted into an elite school with a below-average GMAT score, I recommend researching a phenomenon called the Superstar Effect. The Superstar Effect proposes that if you are able to distinguish yourself enough to become a top expert in a particular field, you can bypass some of the traditional admissions criteria (GPA, GMAT, etc.) Students that are admitted to elite universities with below-average test scores often fall into this category. 1. It may get you a partial or full scholarship at some schools. Usually, these will be schools ranked in the second tier or lower. However, if you are smart enough to score a 760 on the GMAT, you probably also know that an MBA from a second-tier school is worth much less than an MBA from a top-20 school. So, the savings on your up-front tuition investment must be measured against the possible future benefits you are giving up by attending a lower-ranked school. 2. 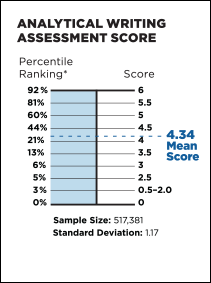 It qualifies you to teach the GMAT for a test-prep company that requires you have a 99th percentile score. These jobs can be quite lucrative; however, they are also very competitive. You’ll still have to go through the interview process and compete against other 99th percentile scorers, some of whom may have more teaching experience. Also, I don’t imagine you are applying to business school with the hope of teaching the GMAT. Ultimately, whether to spend the effort to achieve a 99th percentile score is up to the individual applicant. While the raw numbers indicate that 750+ scorers are favored over 700-740 scorers, the incremental effort to boost your score may be better spent elsewhere. Thanks for getting these stats together.  I agree with your overall conclusions about priorities in applications. One point that I think you’ve left out is the correlation between intelligence and GMAT performance. A) GMAT score is not simply a function of time spent studying; it is a function mostly of intelligence, partly of study time, and partly of the variability of the test, so one can’t assume that it’s even possible to get a 750 simply with extra study time. B) The higher acceptance rate that you have identified for 750+ scorers doesn’t take any other information about candidates into account. Top scorers have more innate intelligence, on average, than average scorers and intelligent people perform well on more than just the GMAT. They’re probably, on average, better writers with stronger essays, higher average undergrad GPAs, from more prestigious undergrad institutions (having done, on average, better on their SATs) and so on. where the w’s would be values indicating the weight / importance of each application component. In that situation, you might in fact find that the weight of the GMAT in predicting acceptance isn’t that great. It only APPEARS to confer a significant advantage when it’s treated as a single predictor, standing in as a proxy for ALL of the predictors with which it is correlated. Rule #1 in stats: Correlation does not imply causation. Higher GMAT performance correlates with higher acceptance rates, but does not necessarily cause these acceptance rate advantages, because both GMAT performance and acceptance rates are correlated with other applicant performance measures. All of this leads, of course, to the same conclusion that you draw: becoming a stellar applicant, ACHIEVING something — that’s what’s really going to boost your acceptance rate. And, if you’ve got the brains to do that, you’ll probably also get a reasonable score. Study, too, but there are diminishing returns. If you’re going to DEVOTE yourself to something, it shouldn’t be learning how to take a standardized test. I dispute the calculations here. The yield is not going to be the same at Kellogg for 750+ GMAT applicants. So we cannot assume a 57% yield for that cohort. I’d imagine its more normally distributed, so I think the calculations here may significantly underestimate the relationship between GMAT and estimated acceptance rate. I’m the unusual case of someone who got above a 46 on verbal section of the GMAT. My scores are Q 42 (59%), V 51 (99%) for a total of 740 (97%). This was on my second attempt. On my first attempt I scored Q 42 (59%), V 44 (97%) for a total of 700 (90%). I scored 48 on verbal. Mnya-mnya-mnya.